I love going to cafés and sipping on a plain ‘ole black coffee, or a soy latte, or, my latest discovery, a soy misto (similar to a latte with the strong Americano taste of coffee). These warm moments are superbly enhanced by good company, and engaging, stimulating conversation. A good book can be a lovely companion as well… or, even a pen and journal. 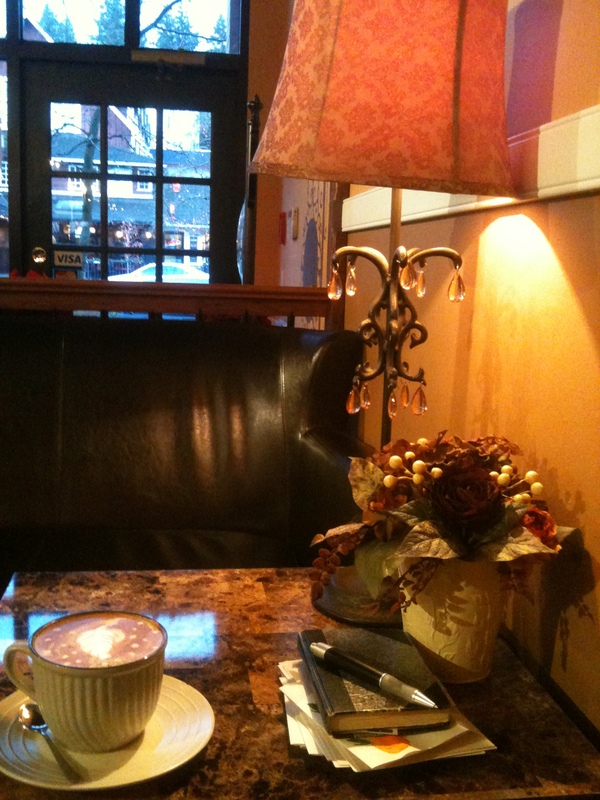 Environment is key, though, and some cafes have it, and some… don’t. What makes a good “hang out”? Well… I guess it depends on your mood, but usually I love a place that offers comfy chairs, good intimate lighting, and some great art on the walls. Ah… yes… great art. Again, some cafés have it, and some….don’t. My favourite Sunday café, Cafe Dream (currently in the middle of a name change) in Dunderave, West Vancouver is home to all of the above. Sean Choi, the owner, used to be a sushi chef and wondered how the role of barista could relate, but after too many Tim Horton coffees, he wanted to embrace the finer world of fresh organic coffee. He has done this well by exchanging his love of sushi details to the fine art of coffee. And… he loves art, paintings. Cafe Dream, in a prior life, launched the artistic career of a good friend of mine, Tom Carter, and soon it will be exposing another artist friend (details later). At present the walls are full with mature, beautiful works of an impressionistic style by Barbara Nirman. 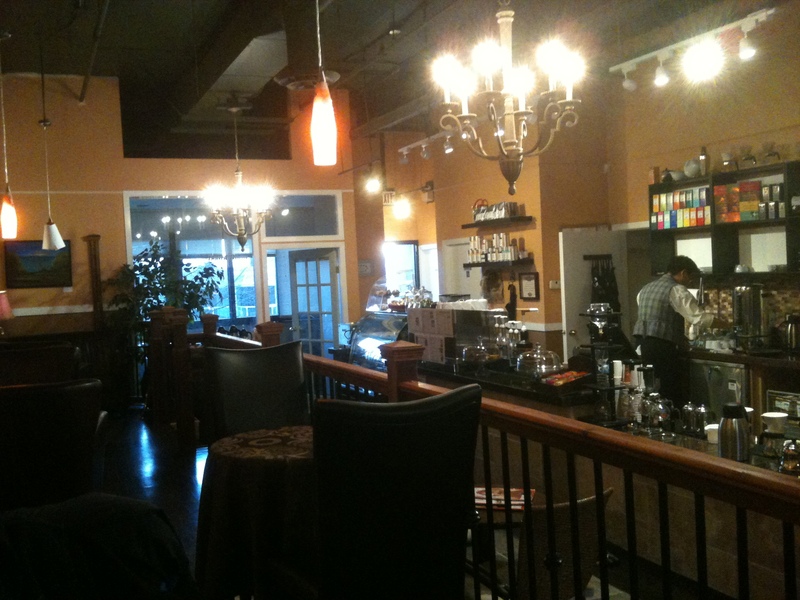 Sean has created a warm atmosphere with classical music that supports both the art of coffee and the art of paintings. A complimentary mix! Im an actor from the Capilano Musical Theatre program. I just now came acsors your site and while I commend you on your effort to inform the public on the musicals in Vancouver, you sir have missed several shows.The Threepenny Opera: A rarely done musical but stunning production design and standout performers Exit 22 at Capilano UniversityBye Bye Birdie. Also fantastic production designs as well as a fun and talented actors at Studio 58 at Langara CollegeReefer Madness, by a small local company. Small yet packed with talent , at the PAL theatre I see nothing on here.Flower Drum Song, an older, dated but gem of musical theatre history by Rodgers and Hammerstein produced by Vancouver Asian Canadian Theatre which ran for 3 weeks in may/juneTitanic: musical in concert by Applause. A beautiful and haunting show that had a short 4 day run in may. NothingMaybe its time you had a few more people working with you to ensure you actually cover everything in Vancouver. I suggest getting in contact with the Ovation Award committee which I also sit on, local awards for the musical theatre companies. Please contact me and I will gladly get you a ticket for reviewing the evening.